Nintendo is kicking off a new series of videos devoted to showcasing Nintendo Labo's Toy-Con Garage mode, which allows you to create your very own Toy-Con using a basic programming tool. The first video - shown above - talks about how you can use 'nodes' to create inputs and outputs. For example, on the most basic level you can have the Switch screen light up when you press a button on the Joy-Con. At the other end of the scale, you can combine several different nodes to create a system which dispenses a sweet when you insert a coin into a box. The potential is incredible. + Toy-Con Garage mode includes different input and output selections*, called “nodes.” Input nodes include actions such as button presses or motions, while output nodes include reactions such as sound effects or vibrations. In addition, there are “middle nodes,” which allow users to select qualifiers such as counters and timers. + For example, an input node could be gently shaking the Joy-Con controller, a middle node could be a certain number of times shaken, and an output node could trigger a sound effect or a blinking light when the two previous actions occur. + By combining inputs and outputs with different Toy-Con projects, users may discover exciting results. They could steer the RC Car with the Fishing Rod, for example, or use the Motorbike as an instrument. Users can even invent their own Toy-Con creations using common materials from around their house! + With a variety of input nodes, middle nodes and output nodes to choose from, users will have fun experimenting with simple conditional statements (i.e. if you do this, then that happens) to create new experiences. Let us know what you think of this video - and the possibilities that Labo brings - by posting a comment. Now that Kirby: Star Allies is nearly out the door, I expect Nintendo to move on to promote Labo for the next month. It's their new gimmick and there aren't any other 1st party games coming out in April. I used to own something called a programming board as a kid and I loved to create little games on it. Labo takes this to the next level and I'm very happy Nintendo is doing this. Every young mind that gets interested in programming this way is a win. @SLIGEACH_EIRE Hey! There's a lot in April (for me at least): SD Gundamn Generations, Wonder Boy, Steamworld Dig 2 physical, Darkest Dungeon Physical, and Wild Guns are on my list. As for this. This is my main reason for buying Labo. Love feeling out and tinkering with stuff. This will keep me busy for a long time. Gimme. @Vapeguy It would be bad if they charged $70 for "catdboard". Im so into this. In going to spend a lot of hours there! I fully applaud Nintendo for trying to get kids into creative design and (albeit basic) programming. @SLIGEACH_EIRE If an article on here doesn't interest you, don't comment! You just come across as a troll. @PhilKenSebben Nothing from Nintendo themselves. @SLIGEACH_EIRE They just put out a crapton of new games the past year. Not expecting too much but ports and smaller stuff until next year at least. Development takes time. Edit: We also still have Smash coming (rumors going both ways on if it's a port/upgrade or new tho), Metroid Prime, and Pokemon. Who knows what the other studios are now up to, now that their babies are out the door. One project better be a Prime Trilogy port tho. Wow, i can make Drum Kit ?! @HappyAxiom Those kind of kits are really cool. I remember similar kinds of electronic experiment kits when I was younger. I think they're more tangible than some aspects of Labo. Yes you're hands on making the toy but then it's kind of computer programming on the Switch in the Toy-Con Garage. This is a simply ingenious move by Nintendo. Schools all over the world will be adding Labo to their curriculums. You know you've made it big when your work enters the classroom. @sillygostly Nostradamus? There's the little matter of buying a Switch for €330, on top of paying €70 for Labo. €400? That's just for one. And if you want to be making all of these cardboard toys accurately then you really need to be buying more of the official kits. As an example, you can buy tablets, which have far more functionality than a Switch and they cost less. @SLIGEACH_EIRE I understand that you don't have anything else to do, but coming to NintendoLife to correct everyone's spelling mistakes isn't the best way to fill in your spare time. So I suggest you stop doing that, it comes over as quite patronising. @Octane It was a joke, as they said: 'In before the "but it's 70 dollars for catdboard" crowd.' If you're going to mock people that don't agree with certain aspects of Labo, but botch your mockery, then what do you expect? And you want to talk about patronising? "I understand that you don't have anything else to do." Really!? I don't correct everybody's spelling mistakes. I know what you're talking about. You're talking about how I spot and correct mistakes in the stories on this site within seconds. It doesn't take much effort to proofread an article before putting it up. It's a professional site with journalists. It just gets more and more impressive with everything I see. This is the kind of thing that is going to help the Switch sell in the Wii numbers by the end of its life. And if Nintendo has more stuff like this in store for Switch then I wouldn't be surprised if it actually sold more than Wii eventually. This is getting more and more appetising by the minute. What is the youngest age do people think kids will start to enjoy and really get into this? Hopefully this doesn’t encourage more shovelware on the eshop 10 years from now. @beazlen1 I personally got into programming at the age of 9 or 10 with the game I posted earlier on this message board. I think that's generally the age when kids start to get interested in science and try to figure out for themselves how everything works. Everytime I start to feel like I don't need Labo, Nintendo releases another video about it. I really hope this has online sharing. I suspect not, but it would huge. This is actually... really cool. I was actually thinking about this last night! Super excited! @1UP_MARIO That little cardboard dude with the joycon on his back being playable in Smash 6 would be fan-freaking-tastic. I mean, come on, if Nintendo can make the Wii Fit Trainer a viable choice, they can work any little Smash-themed miracle. This looks like Nintendo may have quite the educational tool on their hands. This is amazing! My client's speech therapist is coming for an assessment in May and this looks like the perfect tool for making AAC engaging and fun. I was sold before I knew about the toy-con garage and expected limited customization. Then, I expected toy-con garage to be quite limited. It's just better and better. I'm guessing this is going to light up YouTube with crazy custom stuff for a good part of this year. I also suspect some of those adults who thought this wasn't for them are reconsidering. Nintendo isn't messing around with this. There was some serious work put into it. I am super hyped for this! WarioWare D.I.Y. was my absolute favorite DS game, and I've always wanted a sequel of some sort. This looks to scratch that itch! On another note, can this site please ban that clown with no life already? @SaKo Warioware DIY is my only experience of this kind of stuff and I had a blast with that game. Hopefully Labo is on a similar level to that, maybe even create your own assets, and create some minigames or puzzles. 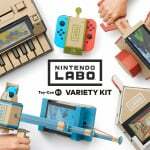 Labo has definitely creeped up from "That's pretty cool. I hope families get good use out of it because I would use it for a few minutes and put it away." to "Where is the cheapest place to preorder this because the Toy Con Garage looks the bomb." This is cool. With 3 nodes and allowing combinations of multiple ones this will get complex fast, and that's great. There's going to be some really cool things created. A wonderful idea for kids and playful, inventive adults alike. I could see schools embracing this too. Many of them have robot labs and the like. This is brilliant, and a great way to get kids interesting in programming. It will be great to see if the kids have an interest and introduce them to the topic, before jumping to other more complex things. I think I'll be way too dumb for Garage. Lol. But this is really cool! @JaxonH Does Labo get the GCU discount at BB? No Prime discount on Amazon. I'm planning on getting it at Gamestop, I have $20 from Gran Turismo Sport I traded in from PSVR. Seemed worth it, made my PSVR headset purchase $157 as my kid gave me $40 for the camera. I should probably give him that back, he never uses it. 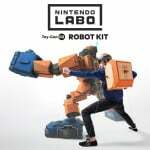 We'll probably get Labo end of June, maybe a Father's Day sale at Target. Not at TRU, one less place to compare prices. So the pronunciation of garage as "gar-idge" like porridge, is that British or is the rest of the world pronouncing it like that as well? Here in NY it's always pronounced "ga-rarjh" or something like that, as if a Pokémon were saying it. I need a t-shirt of that "Do something - something happens" black screen. Maybe just the words on a black t-shirt. So simple yet so explanatory. You bet it does. 20% off all day e'ry day. I got 6 months free Prime Student. I'm not sure why, I'm not a student, but they almost wouldn't let me order without signing up, they seemed very determined. I guess Sprint is getting all my Amazon info now, oh well. I'm expecting all my TRU Reward member info to be sold any day now. I like goh-roj That is so not what he was saying in the video. Jesus, what is wrong with some of you? I don't often agree with @sligeach_eire, but all they did was predict that Nintendo would advertise Labo soon, and make the most mild joke I've ever seen at someone else's typo. Apparently some of you see this as grounds to "ban that clown". I would have loved the heck out of this when i was young with a lot of free time!